Where a CSF Leak is suspected as a result of symptoms, establishing the location of the leak is generally the next step. While success can be had with some spontaneous spinal CSF leaks through high-volume blind blood patches without knowing the location of the leak (the success rate is thought to be around 40%), in many cases establishing precise location of the hole or tear can be critical to proper management and enables more directed treatment. A variety of imaging techniques, scans and investigations can be undertaken to determine where CSF is leaking – some are more successful than others. Even where scans are unable to locate a leak site, they may be able to disclose the symptoms that help to confirm diagnosis, such as intracranial hypotension with spinal leaks (e.g. brain sag or enhancement), or identify pockets of cerebrospinal fluid outwith the dura mater. The following summary of imaging techniques and investigative tests has been complied using a variety of sources, including a number of journal articles by Dr W. Schievink, the Medical College of Georgia and Johns Hopkins University Hospital. While we have collated source material and edited it for ease of reference, we make no claim over the intellectual property of the authors of the source material or indeed the accuracy of their work. Beta-2-transferrin is a protein which is almost exclusively found in the cerebrospinal fluid. It is not found in blood, mucus or tears, which makes it a specific marker of cerebrospinal fluid. While cerebrospinal fluid from spinal leaks disperses within the body and cannot therefore be collected and tested, Beta-2-transferrin testing can be a successful, non-evasive test for confirming the presence of cranial CSF leaks. Where CSF is leaking significantly, it may be possible to collect it in a specimen bottle, however, in many cases, pledgets (small wads of absorbent material) are inserted into the nose and ears. Where a traumatic cranial CSF leak is suspected, nasal endoscopy is often performed. This procedure may narrow down the side/site of the leak and may occasionally identify active leaks, but findings are often non-specific. Signs of a leak can include glistening nasal mucosa. Although direct visualisation through endoscopy plays an important role in identifying cranial leak sites, imaging (particularly CT) of the skull base is critical to localisation, particularly traumatic leaks. Intracranial pressure monitoring uses a device placed inside the head to measure the pressure inside the skull. It sends measurements to a recording device and provides doctors with an indication of pressure changes while lying, sitting, standing and walking. There are generally three ways to monitor pressure in the skull (intracranial pressure). Intraventricular Catheter – The intraventricular catheter is the most accurate monitoring method. To insert an intraventricular catheter, a hole is drilled through the skull. The catheter is inserted through the brain into the lateral ventricle. Subdural Screw – This method is used if monitoring needs to be done right away. A hollow screw that is inserted through a hole drilled in the skull. It is placed through the dura mater. This allows the sensor to record from inside the subdural space. Epidural Sensor – An epidural sensor is inserted between the skull and dural tissue. The epidural sensor is placed through a hole drilled in the skull. This procedure is less invasive than other methods. A lumbar puncture (sometimes known as a spinal tap) is a diagnostic procedure used to test cerebrospinal fluid for conditions such as meningitis and subarachnoid haemorrhage, as well as check intracranial pressure. It is generally regarded as a safe procedure, but is not risk-free. It is typically performed under local anaesthetic and aseptic technique. A needle is used to enter the thecal sac and cerebrospinal fluid collected. Fluid may be sent for biochemical, microbiological, and cytological analysis, and opening pressure may be measured. A post-dural puncture headache (PDPH) is not uncommon in many patients following the procedure, and as such, may make spinal CSF leak symptoms appear worse; this is normally temporary, but occasionally symptoms may worsen more persistently. It is thought that this may be more common in patients with a connective tissue disorder. Lumbar punctures can be uncomfortable and patients make experience some pressure and pain sensations. Back ache at the puncture site is also common in the days and weeks following the procedure. 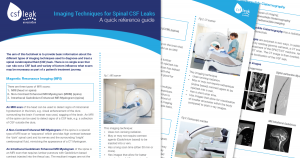 Where a suspected spontaneous CSF leak is concerned, it is important that medical professionals carefully weigh up the benefits of a lumbar puncture over the potential risk of creating a new leak. In all cases, a fine bore, non-cutting pencil tip needle should be used to perform the lumbar puncture. This reduces the risk of the new hole not healing. Spontaneous leakers should ideally spend at 24 hours lying flat following a lumbar puncture to aid healing, during which bending, straining, lifting ,sneezing and constipation should be avoided. Multiple imaging studies have been used to localise cranial defects which can cause cranial leaks, but the most common is technique is high-resolution Computed Tomographic (HRCT) scanning. A HRCT scan uses 1- to 2-mm sections in both the coronal and axial planes with bone algorithm, resulting in localisation of the majority of skull base defects that can result in CSF leak. HRCT technology can be used with most surgical image guidance systems. Due to the relative ease of obtaining this study and high degree of accuracy, this method is often used as the primary imaging modality for traumatic cranial CSF leaks. Plain CT scans may lead to false-positive results secondary to volume averaging, and their use is generally be limited. The use of intrathecal fluorescein in combination with HRCT allows for the identification of most cranial CSF leaks. It is important to note that congenital or acquired thinning or absence of portions of the bony skull base may be identified and may not necessarily correspond to the site of CSF leak. HRCT scans may only have limited use in identifying CSF leaks located in the spinal region. Intrathecal agents can be used both to confirm the presence of, and to attempt to localise, CSF leaks. The agent is administered via lumbar puncture into the subarachnoid space (within which the cerebrospinal fluid circulates) and, as such, there are associated risks and complications can be serious. Visible dyes, radiopaque dyes, and radioactive markers have been used with a positive results. Intrathecal fluorescein is currently the most common visible agent. Intrathecal fluorescein has been associated with multiple complications, including grand mal seizures and even death. However, in a study of 420 administrations low-dose (50 mg or less), intrathecal fluorescein was found to be useful in localising CSF fistulas and was deemed unlikely to be associated with adverse events, as most complications were dose-related. The current recommended dilution is 0.1 mL of 10% intravenous fluorescein (not ophthalmic preparation) in 10 mL of the patient’s own CSF, which is infused slowly over 30 minutes. Patients should be extensively appraised of the risks by their doctor, as this use may be “off-label use”. CT Myelography, sometimes called CT Cisternography, involves the intrathecal administration (lumbar puncture) of radiopaque contrast (metrizamide, iohexol, or iopamidol) followed by CT scanning. Studies have shown that approximately 80% of CSF leaks can be confirmed through this technology. Weaknesses include its invasive nature, which can limit its use particularly with young children, as well as its low sensitivity in small, intermittent or ‘slow’ leaks. Positive findings usually reveal pooling of contrast in the frontal or sphenoid sinuses or outwith the dura mater, but may not necessarily locate the actual hole or tear. A variety of radioactive markers have been used with relatively good effect to detect CSF leaks, including radioactive iodine (131I)-labeled serum albumin, technetium (99mTc)-labeled serum albumin or diethylenetriamine penta-acetic acid (DTPA), and radioactive indium (111In)-labeled DTPA. This technique is similar to intrathecal fluorescein and involves administration of the tracer via a lumbar puncture. Intranasal pledgets are normally placed in defined locations under endoscopic guidance and analysed for tracer uptake approximately 12 to 24 hours later. A scintillation camera is also used, but has poor resolution and difficulty precisely localising the leak. Overpressure radionuclide cisternography increases the intrathecal pressure with a constant infusion to improve the sensitivity of radionuclide cisternography; however, this technique is not common place in the UK and through use in the USA has been shown to result in a high degree of false-positive findings, with sensitivities from 62% to 76%. Magnetic Resonance Imaging (MRI) is generally thought to be less effective than CT Myelography or MR Myelography at detecting the specific site of CSF leak, unless it stems from a sizable tear, but it does have a use in the diagnosis of Intracranial Hypotension through the disclosure of pockets of CSF outwith the dura, secondary conditions and symptoms. While the symptoms of those diagnosed with Intracranial Hypotension worsen in the vertical position, studies have shown that MRI scans undertaken with patients sitting upright or standing generally show no discernable difference to those undertaken lying down[i]. MRI with fat suppression sequences is increasingly regarded as being the most appropriate MRI type for successfully disclosing CSF pockets outwith the dura. MRI studies may show pachymeningeal enhancement (when the dura mater looks thick and inflamed) and the downward displacement of the cerebellar tonsils through the foramen magnum (known as an ‘Arnold-Chiari’ or simply ‘Chiari’ malformation) due to the decreased volume and buoyancy of CSF in which the brain floats. This is present in many, but not all, cases[ii]. Standard MRI scans may also show the engorgement of the cerebral dural venous sinuses, the cerebral ventricles may be reduced in size and the pituitary gland may appear enlarged. There may be apparent downward displacement of the optic chiasm and the upper cervical epidural veins may appear congested. Spinal MRI scans for patients with a suspected CSF leak may show some irregularity of the thecal sac due to partial dural collapse. Extradural fluid collections are common in spinal cerebrospinal fluid (CSF) leak. Intense extradural contrast enhancement may be noted in congested epidural veins. One or more CSF fistulas may originate from spinal nerve root sleeves in the case of spontaneous spinal CSF leak. A new MRI technique, using intrathecal gadolinium contrast, is becoming more common, although is still relatively uncommon in the UK. Introducing contrast into the CSF can increase the likelihood of an MRI scan disclosing the location of a leak, particularly if administered with a solution such as Elliot’s B to raise intracranial pressure. As is the case with CT Myelography and Radionuclide Cisternography, the procedure is considered fairly safe, but there are risks whenever foreign bodies are introduced into the cerebrospinal fluid. It is important to note, however, that standard MRI imaging can present as completely normal and, for some doctors, are not the study of choice[iii] for the detection of a leak site. MRI imaging presenting as normal does not mean that a CSF leak is not present and that Intracranial Hypotension is not the correct diagnosis. Magnetic Resonance (MR) Myelography, sometimes called MR Cisternography, is a study of the spinal canal and subarachnoid space using high-resolution Magnetic Resonance Imaging (MRI) that has been shown[iv] to be accurate in localising CSF leaks for patients with spontaneous intracranial hypotension (SIH). MR Myelography comprises a special MRI technique in which a sequence with heavy T2-weighting is used to provide high contrast between the ‘dark’ spinal cord and its nerves and the surrounding ‘bright’ cerebrospinal fluid, mimicking the results of Computed Tomographic (CT) Myelography. Fat suppression technology is normally used. Studies have demonstrated[v] that heavily weighted MR Myelography can successfully detect abnormal cerebrospinal fluid (CSF) collections and CSF leakages, such as C1-2 extra-spinal collections, CSF along nerve root sleeves, and epidural fluid collections, with only with minor discrepancies compared with CT Myelography studies. This is normally a non-invasive, non-contrasted and time-saving technique and is often considered as an alternative to invasive CT Myelography, before embarking on targeted epidural blood patches. However, intrathecal gadolinium can also be administered and can increase the likelihood of leak detection. MR Myelography is proving to be a promising study for patients with SIH, with some studies suggesting sensitivity in the region of 85% to 92% in relation to cranial leaks, with 100% specificity, albeit lower for spinal leaks, but further large-scale validation studies are needed. Digital Subtraction Myelogram (DSM) is similar to CT myelogram and uses intrathecal contrast, however is performed under fluoroscopy. It also utilises the ability to digitally subtract a pre-contrast image in order to enhance the visibility of the contrast. In a medical study carried out in 2012, featured in the American Journal of Roentgenology, eleven patients underwent digital subtraction myelography. All of the patients had previously undone MRI imaging which showed extradural fluid collection on average up to a length of 15.5 vertebral levels. Digital subtraction myelography was used to successful locate the site of the CSF leak in nine of the 11 patients, and all of the dural tears disclosed were located in the thoracic spine between T3 and T11. Digital subtraction myelography has been shown to be a valuable diagnostic tool for the localisation of rapid spinal CSF leaks and is increasingly considered in patients who are clinically suspected to have a dural tear that is accompanied by a longitudinally extensive extradural fluid collection on spinal MRI. It is not yet, however, commonly used in the UK. There are a great many sources of online information relating to imaging techniques for the localisation of CSF leaks. Technology is, however, changing rapidly and along with it the scans of choice for diagnosis and localising the cause of intracranial hypotension. At this time, we would also recommend journal articles on diagnosis and localisation of CSF leaks by Dr Wouter Schievink (Cedars-Sinai) in the USA, such as “Spontaneous Spinal Cerebrospinal Fluid Leaks and Intracranial Hypotension” (2006), “Diagnostic Criteria for Spontaneous Spinal CSF and Intracranial Hypotension” (2008) and “Misdiagnosis of Spontaneous Intracranial Hypotension” (2003). J.J. Akbar et al. “The Role of MR Myelography with Intrathecal Gadolinium in Localization of Spinal CSF Leaks in Patients with Spontaneous Intracranial Hypotension” (2011) is also worth attention.